I’m not sure why this song popped up in my head a few weeks back. I used to sing it occasionally a long time ago – mostly just around the house or in the car – having absorbed it from Mike Waterson’s irrepressibly individualistic recording on The Watersons’ LP Sound, Sound Your Instruments of Joy. Having decided to resurrect the song, I thought I’d check out other versions. I wasn’t sure if it was one of those songs which is widely sung in the folk revival, but rarely if ever collected from tradition. Actually the VWML Archive Catalogue shows that it has been quite widely collected – but particularly in Herefordshire, Shropshire and Worcestershire. so it just made sense to carry on singing the same words I had always sung. 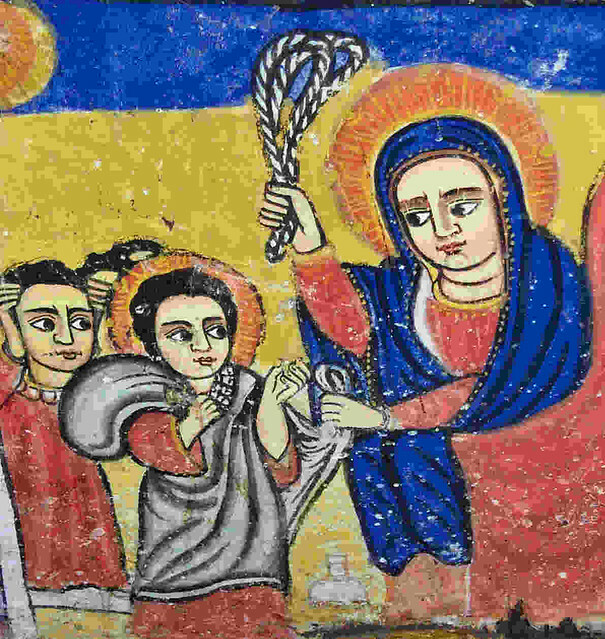 Mural from the monastery church on the summit of Bahar Dar, Lake Tana, Ethiopia.